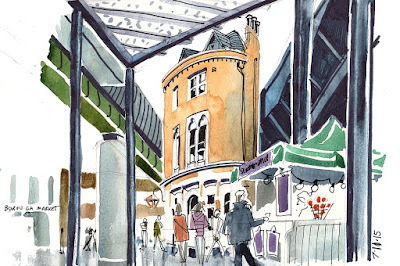 A very busy Borough Market was the venue for a recent London Urban Sketchers outing. I arrived late so wanted to get started quickly and noticed this lovely little building, the Globe Tavern, dwarfed by the steelwork and railway bridges. I didn’t know at the time but the flat above the pub was used as one of the locations in the film ‘Bridget Jones’s Diary’. 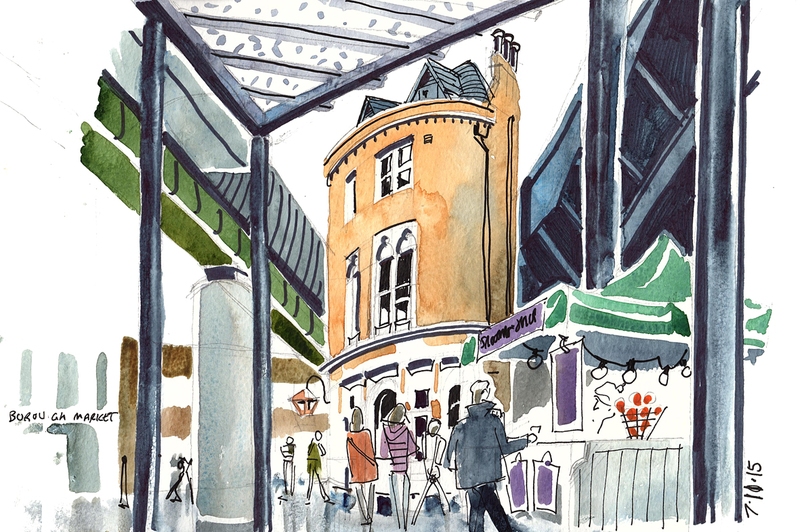 In the afternoon, after sampling some of the delicious food the market has to offer, I chose to draw inside the main market building. 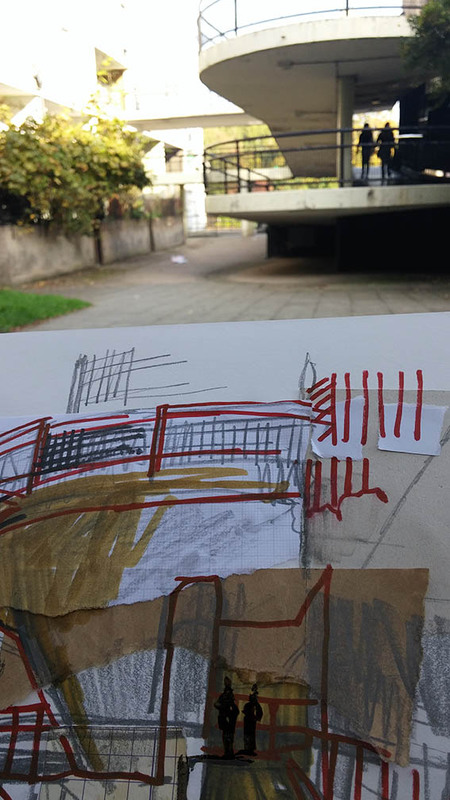 I found the structure is so complicated to draw, with sections added here and there as the market expanded. It was really enjoyable though and I highly recommend a visit if you are ever in the area. 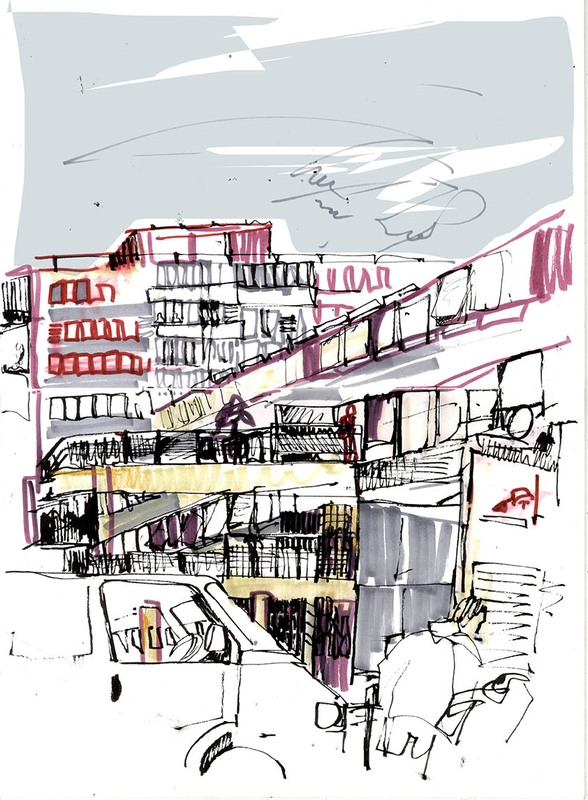 The Borough Market gathering may just have passed, but we have an extra sketchcrawl this month, which takes place on Saturday 14 November leaving from Timberyard Soho, the cafe where the exhibition of drawings by 24 urban sketchers went on display last week. 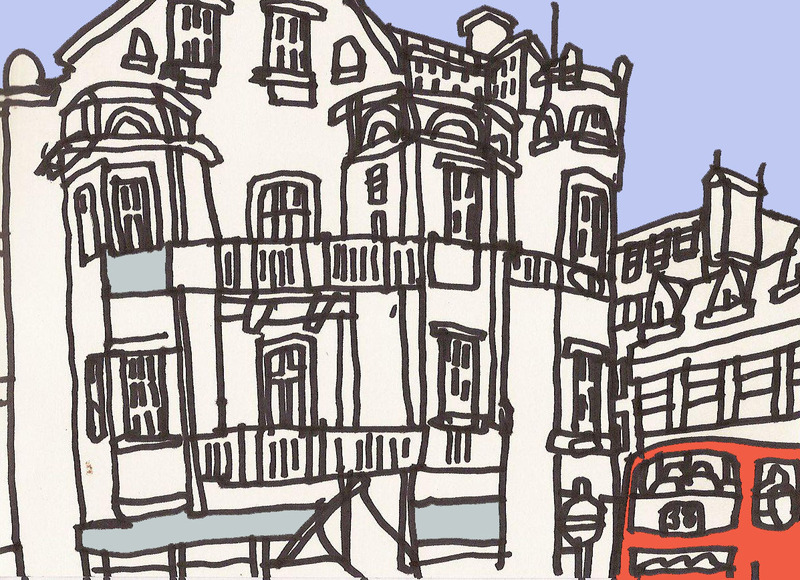 We are meeting at the cafe, which is at 4 Noel Street, London W1F 8GB, map and details here, at 11am. We are planning to end back at the cafe at 2pm, which means a slightly shorter event than usual, but there's no need to stop if you want to go on. We can warm up and see what we've all done back in the comfort of Timberyard at around 2pm. Haven't been before? Don't worry. Come and say hello. It's very relaxed. 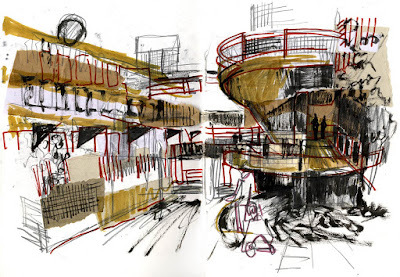 Just bring your own drawing equipment. Just lately I have been documenting places that are under threat, or in the procedure of redevelopment. 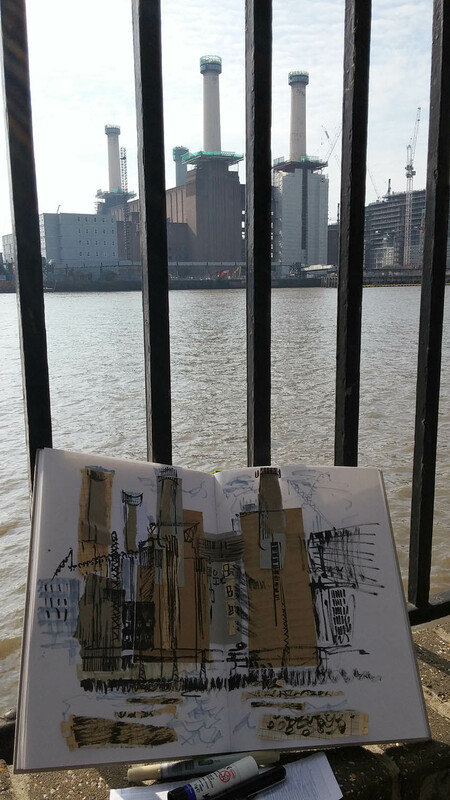 Over the last few weeks I have sketched at two locations in London that are going through this process Battersea Park Power Station located at the South bank of the river Thames, Nine Elms and the Aylesbury Estate in Walworth, South East London. 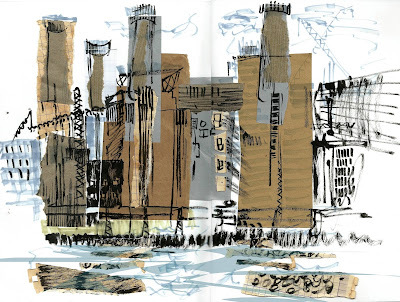 The Battersea Power station was built in the 30’s and has been inactive since the early 80’s. It was also on the front cover of Pink Floyd’s Animal album. 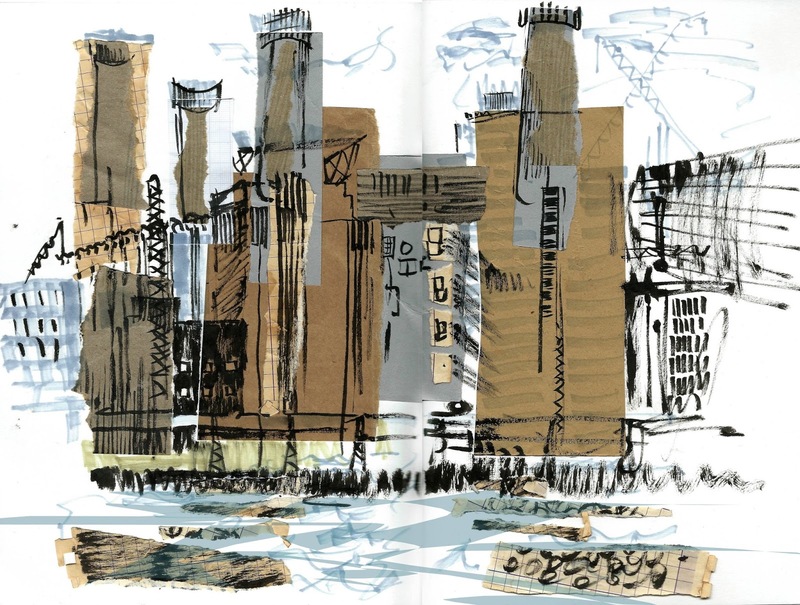 When I was in my late teens I frequently used the train line that passed Battersea Power Station and it was always an iconic landmark for me as the train approached London.I sketched the power station from across the river.I thought that drawing with torn Paper was an appropriate medium to capture the regeneration-taking place. The notorious Aylesbury housing estate is the largest in London built between 1963 and 1977 and accommodates about 7600 people. Protests are taking place to save the estate. 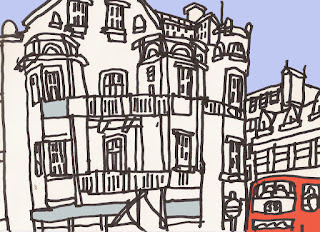 Residents are being moved off the estate, block by block, re-homed and split up all over the country. 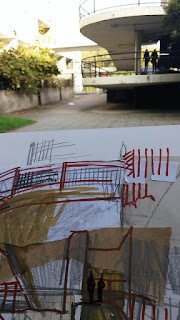 I have used torn paper again in the sketch below, representing its looming future. I couldn’t believe the size of the estate. 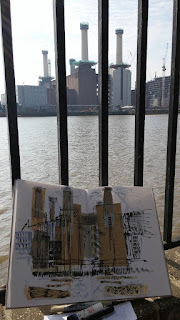 My sketches don’t quite capture its scale. I was captivated by the walkways leading up to the floors. 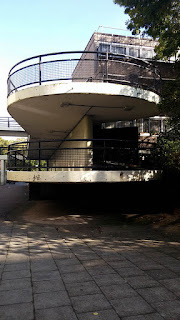 I liked the cylindrical structure of this one. An interesting thought provoking location. A very successful Private View! 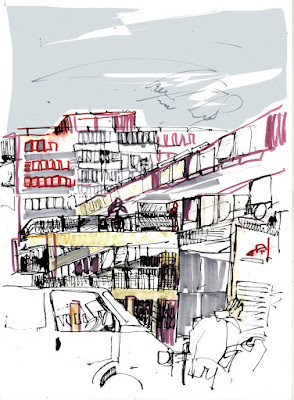 Here are the tweets about last night's private view of the Urban Sketchers London Exhibition at Timberyard Soho. There was lots of scope to get up close to the pics. So... I guess we'll see you all the next sketchcrawls?